Requires some degree of openness (PRIO 2009); Bushland (Richardson et al. 2006); Frost tender, light well drained soil (GAAU 2009); Seedling survival is dependant on regular watering (SCDI 2009); Creek banks (ECOR 2009); Crops; Bushland (Richardson et al. 2006). Colours indicate possibility of Ornithogalum longebracteatum infesting these areas. 1. Restrict human access? Ornithogalum species quickly form large clumps of grassy to strap-like leaves (GAAU 2009). Erect clump forming perennial herbs (Richardson et al. 2006). Grow up to 1.5 m high (Richardson et al 2006). Creek Banks (ECOR 2009). Likely to restrict access to waterways in some situations. High nuisance value. People and/or vehicles access with difficulty. 2. Reduce tourism? Poisonous plants, causes skin irritations (DG 2009; GAAU 2009). Ornithogalum species quickly form large clumps of grassy to strap-like leaves (GAAU 2009). Creek Banks (ECOR 2009). Some recreational uses affected. 3. Injurious to people? All parts of the plant are poisonous, and contact with the sap may cause skin rashes (GAAU 2009). Toxic properties at most times of the year. 4. Damage to cultural sites? Onion type bulbous plant (DG 2009; Richardson et al 2006). Unlikely to have strong enough root system to cause structural damage. Moderate visual effect. 5. Impact flow? Creek Banks (ECOR 2009). Ornithogalum species quickly form large clumps of grassy to strap-like leaves (GAAU 2009). Grow up to 1.5 m high (Richardson et al 2006). Loses its leaves annually (FNSW 2009). Drooping strap like leaves (ECOR 2009). Likely to have some effect on flow. Minor impact on surface or subsurface flow. 6. Impact water quality? Creek Banks (ECOR 2009). Ornithogalum species quickly form large clumps of grassy to strap-like leaves (GAAU 2009). Grow up to 1.5 m high (Richardson et al 2006). Therefore likely to reduce light availability. Noticeable but minor effects in either dissolved Oxygen or light levels. 7. Increase soil erosion? Soil erosion is likely despite the presence of O. longebracteatum (ECOR 2009). Moderate probability of large scale soil movement. 8. Reduce biomass? Ornithogalum species quickly form large clumps of grassy to strap-like leaves (GAAU 2009). Erect clump forming perennial herbs (Richardson et al. 2006). Grow up to 1.5 m high (Richardson et al 2006). Biomass may increase. 9. Change fire regime? Succulent onion type plant with thick leathery leaves (DG 2009). Leaves are annual (FNSW 2009). Dried shed leaves may provide a little extra fuel. Minor change to either frequency or intensity of fire risk. 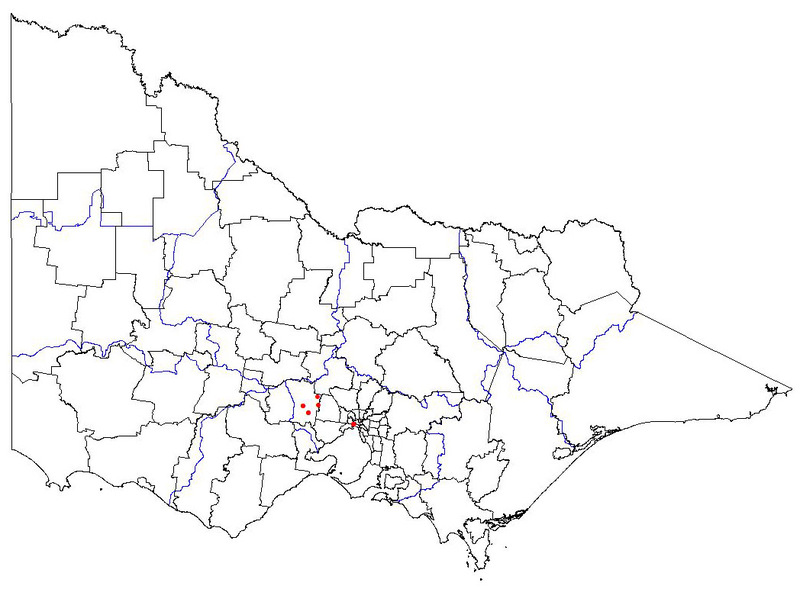 (a) high value EVC EVC = Plains Sedgy Woodland (E); CMA = Glenelg Hopkins; Bioregion = Victorian Volcanic Plain; VH CLIMATE potential. Ornithogalum species quickly form large clumps of grassy to strap-like leaves (GAAU 2009). May inhibit regeneration of native plants that would grow in the same habitat. This is because it forms monocultures/ clumps (Richardson et al. 2006). - Very little displacement of any indigenous species. Sparse and scattered infestations. 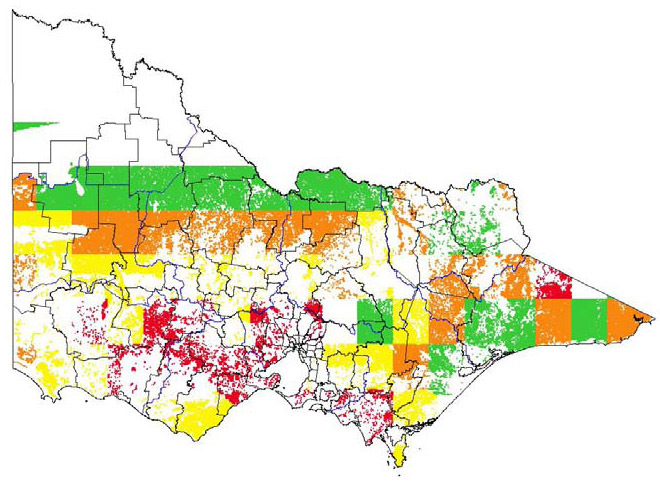 (b) medium value EVC EVC = Cool Temperate Rainforest (R); CMA = East Gippsland; Bioregion = East Gippsland Uplands; VH CLIMATE potential. Ornithogalum species quickly form large clumps of grassy to strap-like leaves (GAAU 2009). May inhibit regeneration of native plants that would grow in the same habitat. This is because it forms monocultures/ clumps (Richardson et al. 2006). - Very little displacement of any indigenous species. Sparse and scattered infestations. (c) low value EVC EVC = Herb Rich Foothills Forest (LC); CMA = Goulburn Broken; Bioregion = Highlands Southern Fall; VH CLIMATE potential. Ornithogalum species quickly form large clumps of grassy to strap-like leaves (GAAU 2009). May inhibit regeneration of native plants that would grow in the same habitat. This is because it forms monocultures/ clumps (Richardson et al. 2006). - Minor displacement of some dominant or indicator species within any one layer. 11. Impact on structure? Ornithogalum species quickly form large clumps of grassy to strap-like leaves (GAAU 2009). May inhibit regeneration of native plants that would grow in the same habitat. This is because it forms monocultures/ clumps (Richardson et al. 2006). Not enough information on its effects on native flora. 12. Effect on threatened flora? Occasionally escape gardens into crops, bushland and roadsides (Richardson et al. 2006). Not enough information on its effects on native flora. 13. Effect on threatened fauna? Ornithogalum species quickly form large clumps of grassy to strap-like leaves (GAAU 2009). Erect clump forming perennial herbs (Richardson et al. 2006). Grow up to 1.5 m high (Richardson et al 2006). Poisonous (GAAU 2009) therefore inedible and reduces food availability. No information on its effects on threatened flora. 14. Effect on non-threatened fauna? Ornithogalum species quickly form large clumps of grassy to strap-like leaves (GAAU 2009). Erect clump forming perennial herbs (Richardson et al. 2006). Grow up to 1.5 m high (Richardson et al 2006). Poisonous (GAAU 2009) therefore inedible and reduces food availability. Reduction in habitat, especially along streams (ECOR 2009), reduction in food, also is poisonous therefore possibly causing illness in fauna. 15. Benefits fauna? Ingesting any part of the plant can result in heart, liver, or kidney failure (DG 2009). Not described as providing shelter and is listed as causing skin irritations (GAAU 2009). Provides very little support to desirable species. 16. Injurious to fauna? Poisonous to ingest and causes skin irritations (DG 2009; GAAU 2009). Toxic properties at certain times of the year. 17. Food source to pests? Scales is the only known disease that can affect the Pregnant Onion (PROI 2009). Poisonous to ingest and causes skin irritations (DG 2009; GAAU 2009). Unlikely to be a food source to vertebrate pests but maybe for insect pests. Supplies food for one or more minor pest species. 18. Provides harbour? Contact with skin causes irritations (DG 2009; GAAU 2009). Grows up to 1.5 m tall, thick leathery leaves (Richardson et al. 2009). Unlikely to provide harbour for serious pest species. 19. Impact yield? Occasionally escape gardens into crops (Richardson et al. 2006). Grow up to 1.5 m high (Richardson et al 2006). Quickly form large clumps of grassy to strap-like leaves (GAAU 2009). Likely to reduce crop yields to some degree. Not mentioned to be a major agricultural weed. Minor impact on quantity of produce (eg. < 5% reduction). 20. Impact quality? Plant parts are poisonous (GAAU 2009; DG 2009). Therefore can cause illness in livestock as well as reducing food availability. Minor impact on quality of produce (e.g. < 5% reduction). 21. Affect land value? Not enough information. Unlikely to affect land value. Not described as being a major problem to agriculture. Being toxic and able to form large clumps may cause a problem nevertheless, but could probably be controlled with herbicide or mechanical removal. Little or none. 22. Change land use? Not described as being a major problem to agriculture. Unlikely to change land use. Little or no change. 23. Increase harvest costs? Control would be necessary as it is toxic (DG 2009; GAAU 2009), causing illness in livestock. It is also known to invade crops, grows up to 1.5 m tall and forms clumps, (Gaau 2009, Richardson et al. 2006) therefore may affect yield and quality of livestock and or crops. Control of this weed is likely to increase harvest costs. Minor increase in cost of harvesting – eg. Slightly more time or labour is required. 24. Disease host/vector? Scales is the only known disease that can affect the Pregnant Onion (PROI 2009). Provides host to minor (or common) pests, or diseases. 1. Germination requirements? Germination sensitive to temperature – temperature below 10 degrees C and above 40 degrees C results in poor germination (SCDI 2009). Requires natural seasonal temperatures for germination. 2. Establishment requirements? Watering less than once a week has a strong effect on seedling survival (SCDI 2009). Pregnant Onions seem to do best in an area that has some shade but exposure to the sun (PRIO 2009). Requires more specific requirements to establish (eg. Open space or bare ground with access to light and direct rainfall). 3. How much disturbance is required? Pregnant Onions seem to do best in an area that has some shade but exposure to the sun (PRIO 2009). Requires some degree of openness. Occasionally escape gardens bushland (Richardson et al. 2006). Can establish under moderate canopy/ litter cover. 4. Life form? Perennial herb (Florabase 2009). Cut leaves down to about 1 inch above the onion bulb head and new ones will grow (DG 2009). Geophyte. 5. Allelopathic properties? None reported in literature. 6. Tolerates herb pressure? Cut leaves down to about 1 inch above the onion bulb head and new ones will grow (DG 2009). Poisonous (GAAU 2009). Non-preferred by herbivores. 7. Normal growth rate? Most species multiply rapidly; May self-sow (GAAU 2009). It grows very fast (DG 2009). Moderately rapid growth rate that will equal competitive species of the same life form. 8. Stress tolerance to frost, drought, w/logg, sal. etc? South African species are frost tender, light well-drained soil (GAAU 2009). Some shade but exposure to the sun (PRIO 2009). Seedling survival is dependent on regular watering (SCDI 2009). Tolerant to at least two and susceptible to at least one. 9. Reproductive system Bulbs and seeds (DG 2009; Richardson et al. 2006). Both vegetative and sexual reproduction. 10. Number of propagules produced? Fruit is a capsule with numerous seeds (Richardson et al. 2006). Produces numerous small bulbs (Richardson et al 2006). Up to 300 flowers (Richardson et al. 2006). Estimated over 1000 seeds and also produces bulbs. 1000­2000. 11. Propagule longevity? No information. 12. Reproductive period? Lives over 100 years. (DG 2009). Mature plant produces viable propagules for 10 years or more. 13. Time to reproductive maturity? Don't expect your plant to flower right away unless it is an older plant (PROI 2009). Most species multiply rapidly; May self-sow (GAAU 2009). Insufficient evidence based on rapidly multiplying 1-2 years. 14. Number of mechanisms? Spread downstream (ECOR 2009). Spread by wind, water, attachment or accidental human dispersal (ploughing – dumping (ECOR 2009). 15. How far do they disperse? Spread downstream (ECOR 2009). Few propagules will disperse greater than one kilometre but many will reach 200-1000 metres. DG (2009) Daves Garden. Available at http://davesgarden.com/guides/pf/go/1792/ (verified 04/2009). ECOR (2009) Ecoramblings Issue 4. Available at http://www.botanicusaustralia.com.au/Documents/EcoRamblings_Issue_04.pdf (verified 04/2009). Florabase (2009) Flora base: the western Australian flora. Available at http://florabase.calm.wa.gov.au/browse/profile/21217 (verified 04/2009). FNSW (2009). Flora of New South Wales. By Gwen J. Harden. Available at http://books.google.com.au/books?id=BZXDWrUebgwC&pg=PA98&lpg=PA98&dq=ornithogalum+longibracteatum+annual+leaves&source=bl&ots=9gaXoLNVC&sig=pXLLV3CXj8kaQR8kFkribkLrKqs&hl=en&ei=z__3Sef0HsGTkAW56pzmCg&sa=X&oi=book_result&ct=result&resnum=1#PPA98,M1 (verified 04/2009). GAAU (2009) Gardening Australia. Available at http://www.abc.net.au/gardening/stories/s1866762.htm (verified 04/2009). Kulkarni MG, Sparg SG, van Staden J (2005) Influence of temperature and watering frequencies on seed germination and seedling growth of Ornithogalum longibracteatum and Tulbaghia violacea. Scientia Horticulturae 107(1), Pages 103-109. PROI (2009) Pregnant Onion Information – Ornithogalum. Ball State University. Available at http://www.bsu.edu/web/mjwest/portfolio/pregonion/poinfo.html (verified 04/2009). Richardson, F. J., Richardson, R. G. Shepherd, R. C. H. (2006) Weeds of the South-East. An identification guide for Australia. R.G. & F.J. Richardson. Department of the Environment and Heritage (Commonwealth of Australia). (1993 – On-going) Australian Plant Name Index (APNI) http://www.cpbr.gov.au/apni/index.html (verified 26/03/2009). Global Biodiversity Information Facility (GBIF) (2008) Global biodiversity information facility, Available at http://www.gbif.org/ (verified 26/05/2009). Integrated Taxonomic Information System. (2009) Available at http://www.itis.gov/ (verified 26/03/2009). Missouri Botanical Gardens (MBG) (2009) w3TROPICOS, Missouri Botanical Gardens Database, Available at http://mobot.mobot.org/W3T/Search/vast.html (viewed 26/03/2009). United States Department of Agriculture. Agricultural Research Service, National Genetic Resources Program. Germplasm Resources Information Network - (GRIN) [OnlineDatabase]. Taxonomy Query. (2009) Available at http://www.ars-grin.gov/cgi-bin/npgs/html/taxgenform.pl (verified 26/03/2009).